Brake Problems? Are You Having Issues With Your Brakes? Are you having brake problems in or around Plainfield, Naperville, Bolingbrook, IL? Brake problems can be very dangerous, especially if ignored like nothing is wrong. Some common brake problems can include all out brake failure, overloaded brakes, locked brakes, brake squeaking or even grinding, broke brake line, failed master cylinder, brake fluid leak, frozen wheel cylinder or caliper. When you brake, you need to stop, brake problems should be taken care of ASAP. You brake it, we fix it, from a-z. All Out Brake Failure – All out brake failure can happen for many reasons. All out brake failure can usually be prevented with brake maintenance. But sometimes brakes do fail for other reasons. Maybe your brake booster or master cylinder goes our on you. Then you have no brakes, pedal goes to the floor, then we all hope you remember that you have an emergency brake. When brake failure occurs sometimes people are caught so off guard they forget that they have an emergency brake. Trust me it happens to the best of us. If you do remember lets hope your e-brake is in good working order. Overloaded Brakes – What are overloaded brakes you wonder? Overloaded brakes occur when you overload the weight capacity that your vehicle was designed to haul, transport, etc. When you go overboard on the amount of weight your vehicle can safely move. Which hence your brakes were only designed to stop a certain amout of weight. Which in hand overloaded brakes, work harder, overheat, work to their designed full potential then boom overloaded mechanical brake failure. Point being don’t overload your vehicle. Locked Up Brakes – These days most vehicles come standard with ABS also known as anti-lock brakes. But there still are vehicles out there that do not come with this feature or if old enough ABS wasn’t even born yet. Non-ABS brakes lock up when hard, steady pressure is applied. In a lot of cases locking up your brakes can be very dangerous depending on your circumstances. When suffering from non ABS lock up simply as your wheels lock up release your brake pedal and pump the brake until you come to a stop, plain and simple. Now even with modern day ABS, brake lock up can still be an issue. As in a brake problem. Some brake problems that can cause ABS brakes to lock up include bad brake pads, brake calipers on disc brakes, wheel cylinders on drum brakes or even damaged wheel bearings. Brake Squeaking Or Even Grinding – Brake pads squeal when coming close to replacement time. Brake pads grind when you forget to change them on time. Typically this is how things work. Sometimes squeaking is warranted, as your brakes are going bad. Other times, there ­may be nothing wrong at all. Some brake noise is considered normal. Because different driving conditions can affect brake noise, including severe braking, dusty, sandy, wet conditions, or maybe even humidity. Some high-pitched brake noise happens because some semi-metallic brake pads used on newer cars are harder, safer plus are a longer-lasting alternative to asbestos brakes, but the noise can get quite annoying at times. Hence a reason for ceramic brakes. So if your looking for smooth, quiet braking capabilities under a wide range of temperature plus road conditions. Ceramic may be your best option. Broken Rotted Brake Line – When brake lines age they get brittle, rust, or even dry rot depending on the material. It also depends on if you properly maintain your brake fluid. Over time your brake fluid captures water and other debry which can damage your brake lines from the inside out. Hence an importance of proper brake fluid maintenance. Unless you enjoy replacing brake lines. Where let me tell you it is a job that most mechanic’s do not enjoy. It is very dangerous to drive with a broken brake line, period. If you see a puddle or notice brake fluid leaking from your car, better safe than sorry call a tow truck. A life isn’t worth risking. Brake Pulsation – Brake pulsation is typically caused by warped rotors and or drums. 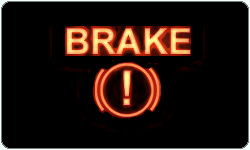 A pulsating brake pedal, may be accompanied by a shuddering or jerky stop during normal braking. You can often see warpage in a brake rotor by simply looking at it. If your rotor has glazed or discolored patches on its face, chances are it is warped. A rotor face should have a smooth feel and look to it. Measuring your rotors with a dial indicator and checking them for flatness will confirm the problem if present. Are your rotors warped? Stop by for a free rotor check. What To Do If You Have A Brake Problem? So if your having brake problems in or around Plainfield, Naperville, Bolingbrook, IL, or even beyond call Last Chance Auto Repair in Plainfield, IL for a free brake inspection.